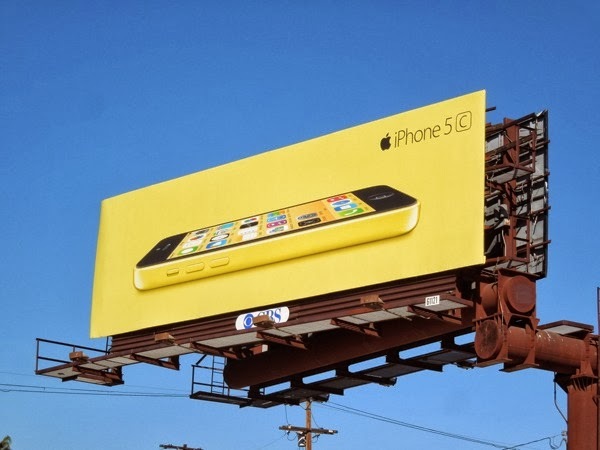 In all this time and all the many ad creatives, who knew what was missing from Apple's billboards was a big burst of colour. 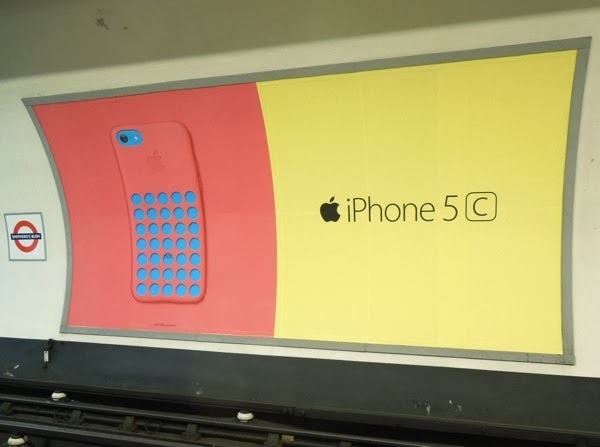 The colour on colour combination shouldn't work, but because it's such a departure from their usual white background design, these ads for the new iPhone 5c stand out even more. 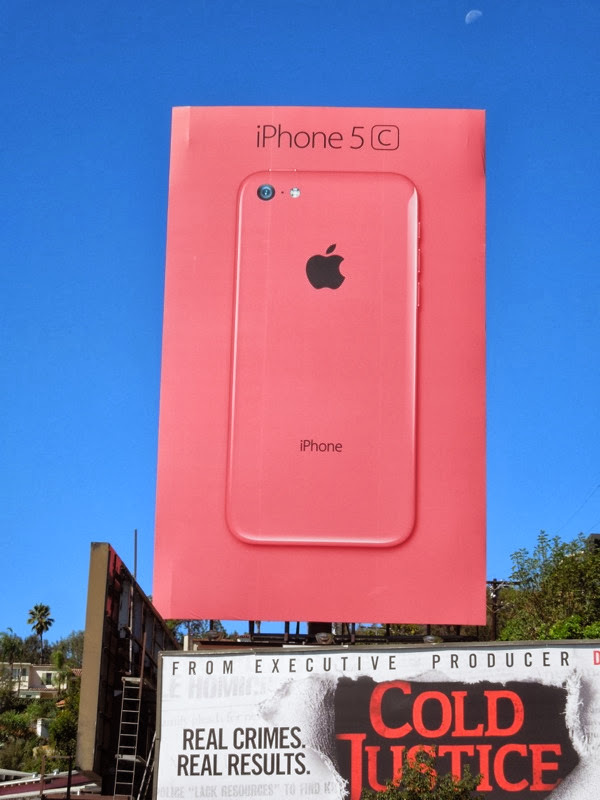 Apple's new plastic iPhone 5c comes in four bold colours, pink, blue, green, yellow and glossy white (for now) and not only is it more colourful for all you fashionistas out there, it's also cheaper to make and retails for less than the iPhone 5 and 5s. 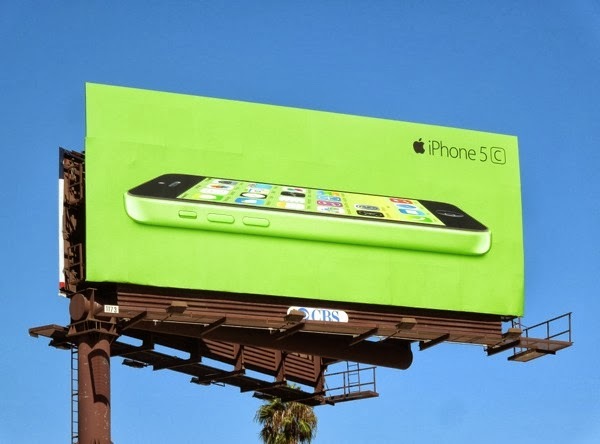 This least expensive iPhone ever was primarily created to appeal to territories like China and other countries where people don't have as much disposable income to spend on gadgets like in the U.S. and the richer parts of Europe (but for us living in America we get to benefit too). 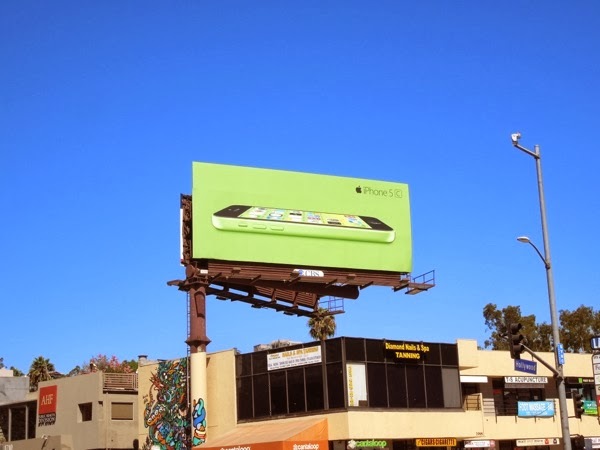 It's a clever strategy and these vibrant new ad creatives certainly pop and do the job of grabbing your attention. 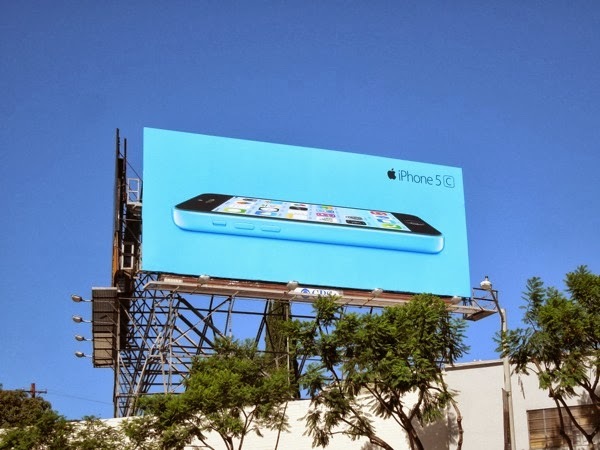 Apple hasn't advertised its iPhone products using out-of-home billboards in quite some time, preferring to focus more on supporting new generations of its iPod and launching its iPad tablet in recent years, so that's another reason these billboards make such an impact. 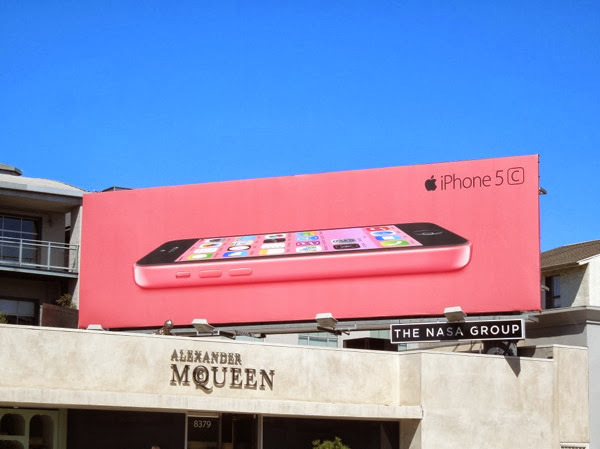 Daily Billboard first spied the bright blue iPhone 5c billboard along Santa Monica Boulevard on September 22, whilst the green and pink landscape versions followed along Melrose Avenue and Hollywood Boulevard the next day. 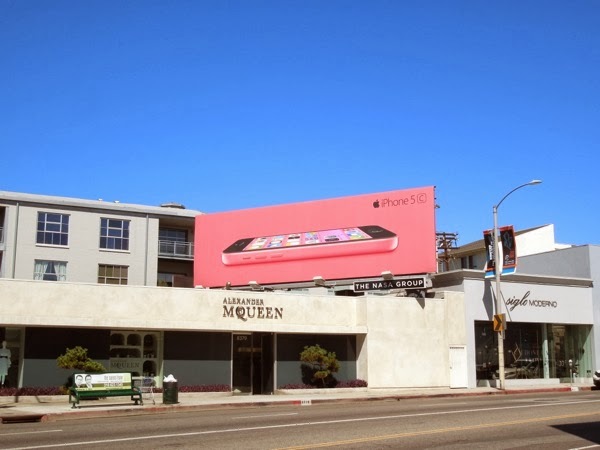 The larger pink portrait billboard which shows the smartphone's back casing and not from a side on perspective, was snapped along the busy commuter zone of Sunset Boulevard on September 26, 2013. 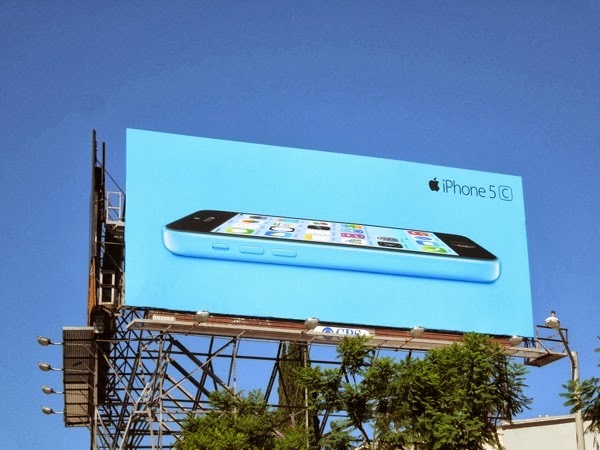 If you're a fan of technology brand's stylish and sophisticated products, be sure to check out these previous Apple ad campaigns from around the streets of L.A.
And if anyone's wondering (wink wink), Daily Billboard's favourite colour is blue. 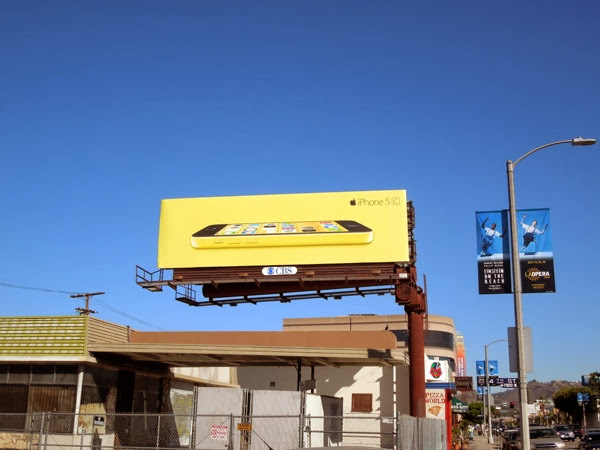 UPDATED: If your favourite colour is yellow, then today is your lucky day, as Daily Billboard spied this yellow creative for the iPhone 5c along Fairfax Avenue on October 5, 2013, completing Apple's vibrant new colour smartphone offering (unless there's also a white version of this creative). 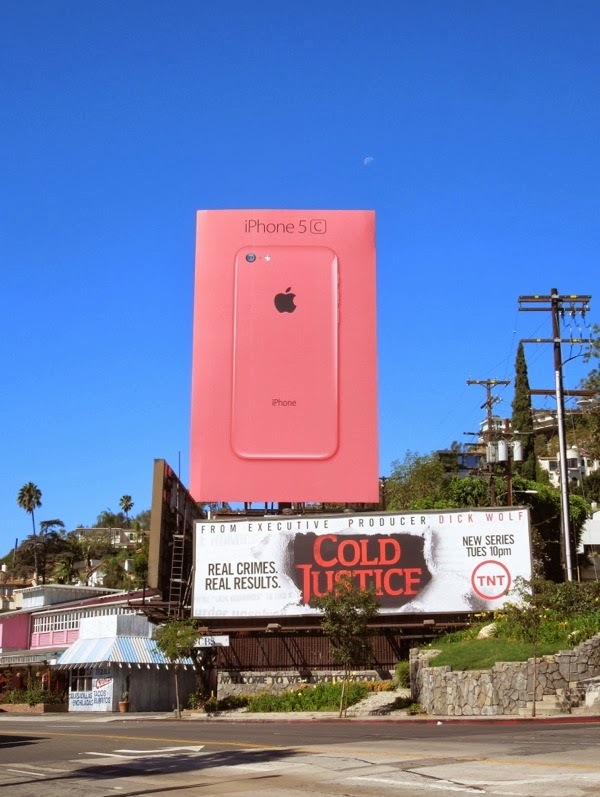 UPDATED: Now that it's nearing the end of November it's time for all the different cooloured iPhone 5c billboards to do a switcheroo and change billboard locations to keep things fresh in the skies of L.A. 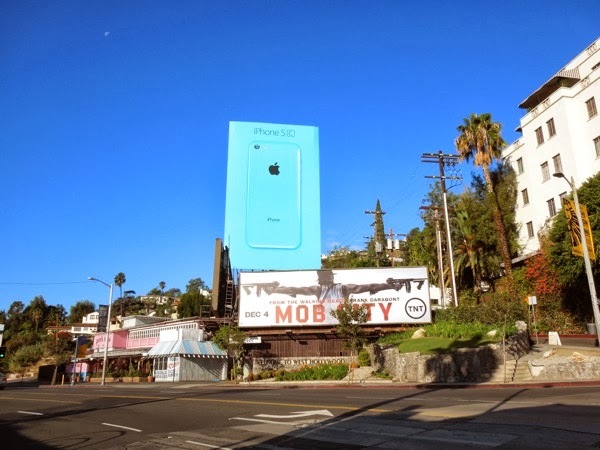 Here's the new giant-sized blue ad creative snapped in Apple's flagship Sunset Boulevard billboard location beside the Cheateau Marmont Hotel on a beautiful November 24, 2103. 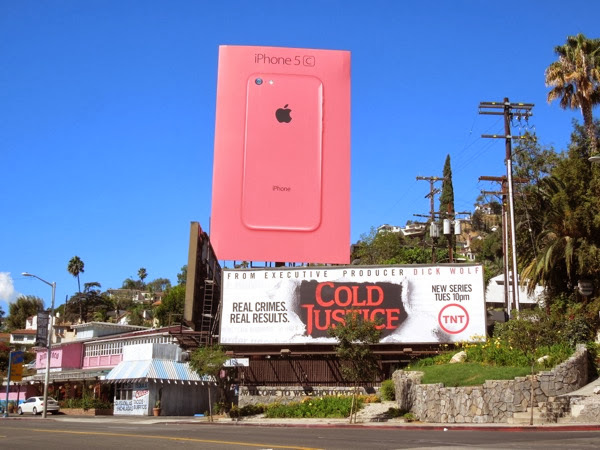 It's pretty amazing to think that the power and popularity of the Apple brand means they don't need any words to convey their message. 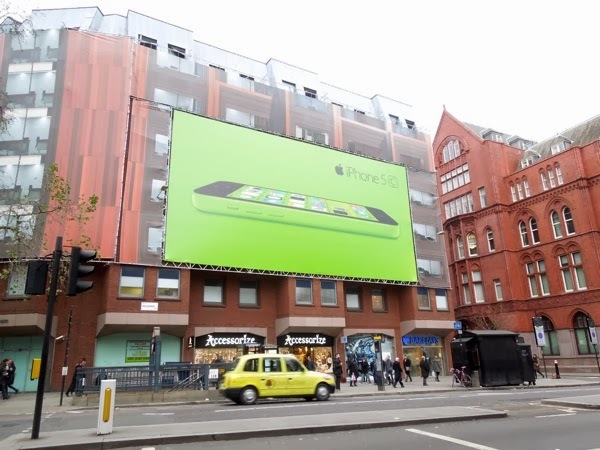 UPDATED: Here's another giant billboard for the iPhone 5c from across the pond in London, snapped near Chancery Lane underground station on December 13, 2013. 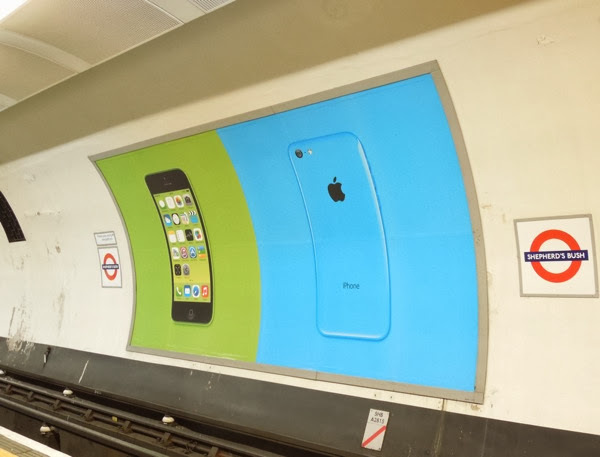 Plus here are some more colourful variants for the Apple ad campaign spied on the London Underground side-by-side on December 17, 2013. 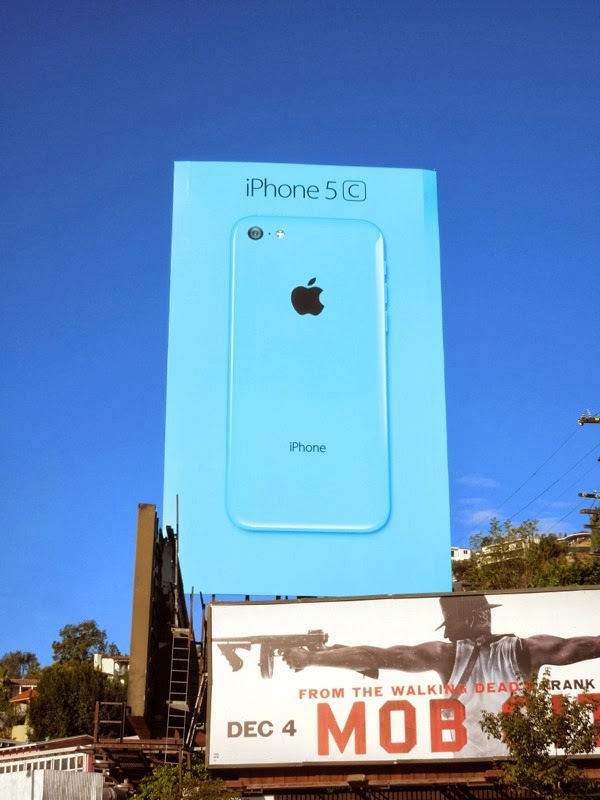 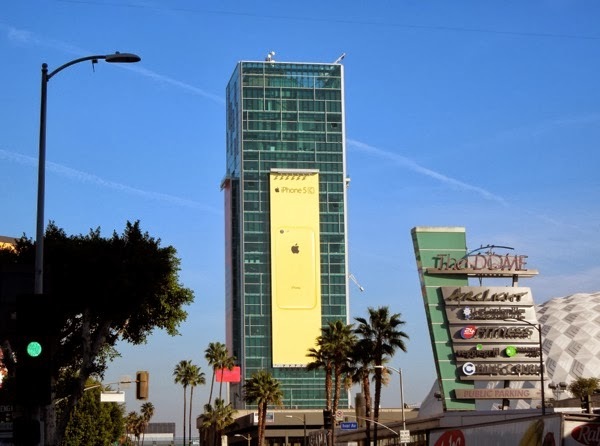 UPDATED: Apple continues to push their iPhone 5c in L.A. in the New Year with some giant-sized billboards appearing on the side of Sunset Vine Tower in Hollywood. 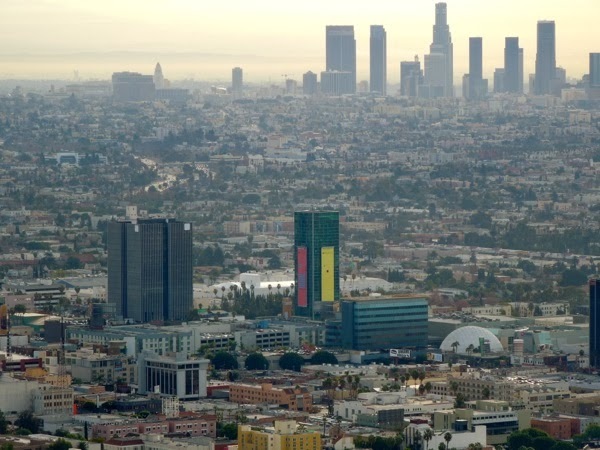 Spotted on January 7, 2014, these super tall creatives certainly stand out from a distance and this photo below was taken miles away from Runyon Canyon.